The time is inevitably approaching when, according to Washington and Brussels, the US-led Western military coalition will finally leave Afghanistan. That is giving Russia a serious headache. It stands to reason that are threats emanating from Afghanistan and affecting Russia’s underbelly in Central Asia. But that is not all. The military equipment and personnel coming out of Afghanistan are a cause for serious concern or, more precisely, wariness on Moscow’s part. Where might they end up? Will the people and hardware coming out of that troubled country actually return to where they came from, or will they settle somewhere along Russia’s borders? That question has no answer for now — both the West and the former Soviet republics flatly deny that they have plans to establish new military bases or temporary posts near Russia. But Moscow cannot be sure about that. The withdrawal of troops and equipment actually got underway six months ago. The international coalition is using several routes to withdraw goods and soldiers. Chief among them are the southern route (through Karachi); the northern route (by rail through Uzbekistan, Kazakhstan and Russia to ports on the Baltic, or from Uzbekistan by air to Russian Ulyanovsk, where Russia has made an airport available); the western route (to the port of Aktau in Kazakhstan and thence to Baku, by rail to Georgia, departing either from the Georgian Black Sea ports of Batumi and Poti, or from Tbilisi via the Baku-Tbilisi-Kars rail line to Turkey, provided it is completed on time). The Western route is of greatest concern. First of all, it is currently the least well-defined. And second, it goes right through the Caspian Sea Basin, an extremely difficult region fraught with animosities. As Timur Urazayev, Kazakhstan’s ambassador at large and special representative for Afghanistan, has pointed out, the Western forces have been using the port of Aktau for transshipping cargos to Afghanistan for two years. “And everybody knows about it,” he told RIA Novosti in an interview. Urazayev maintains that small quantities of civilian goods pass through Aktau. But will that be the case throughout the entire drawdown of the Western presence in Afghanistan? Kazakhstan’s government intends to turn Aktau into a major transit node by expanding the port, increasing the airport’s freight throughput capacity and constructing rail lines to Turkmenistan and Iran. Kazakh officials say that implementation of this plan will enable the United States to ship larger amounts of freight through the Aktau seaport and airport, and Kazakhstan will acquire wholesale commodities in organizing multimodal transportation. President Nursultan Nazarbayev has said that to achieve those goals Kazakhstan is prepared to increase the transit of NATO freight from Afghanistan through Aktau to the Azerbaijan-Georgia-Turkey route. “Transit must be coordinated with the governments of the neighboring states, many of which joined the antiterrorist coalition. For example, Azerbaijan has been actively involved both in humanitarian activities in Afghanistan and in shipping freight to Afghanistan,” said Kamil Salimov, head of Baku State University’s criminology department. Azerbaijan may also continue providing transit services. Especially since a commercial seaport is under construction 70 kilometers from Baku. Such close cooperation between the Caspian Sea countries and the United States has led a number of experts to suggest that an American naval base could be located on the Caspian Sea, although they have not said whether it would be a “transit” node or a center. That would be completely unacceptable to Russia. “The first US Navy-flagged ship of any displacement in Aktau would change the entire military-strategic balance in the Caspian Sea and in CSTO immediately and forever, and it would alter Russia’s position on accepting Kazakhstan into the inner core of Eurasian economic integration. Kazakhstan’s credibility as a reliable ally would vanish once and for all,” Alexander Sobyanin, Director of the Border Cooperation Association believes. Ilgar Velizade, director of the South Caucasus Political Analysts Club, believes that in light of existing risks and threats it is past time to form a single security system in the Caspian Sea region. “Azerbaijan currently is defending its maritime borders by itself. It is doing that not just because its eastern border is an 800-km coastline, but because the coastal zone is home to more than half of the country’s population, and it is where most of its economic potential is concentrated.” The country’s capital — Baku, the largest city on the Caspian Sea coast — is also located there. Until recently, its maritime borders were defended by technical means Azerbaijan inherited from the former Soviet Caspian Sea Navy, which had its main base in Baku. The country’s authorities are currently refitting the navy. Azerbaijan has implemented a program to construct a radar system consisting of seven radar stations, each of which has a range of 200-250 kilometers. It can monitor Azerbaijan’s entire national sector in the Caspian Sea. The fact that these radars “appeared” as part of a US program to help Azerbaijan defend its borders continues to make their true purpose a matter of concern. The suggestion has been made that the system was imposed on Baku by Washington and its true purpose is to carry out surveillance of neighboring countries, particularly Iran and Russia. However, the range of these local stations is limited, and the United States possesses very sophisticated surveillance systems both on the ground and in space. That partially mitigates the concern. Kazakhstan is building its own communications and surveillance system like Azerbaijan’s. Ermek Kozhamberliyev, deputy chief of the Kazakhstan Navy, has said, “It will enable us to monitor the entirety of Kazakhstan’s sector of the sea and will be the Navy’s main command and control system. …We will be able to see what is happening in the Caspian from Astana.” Kazakhstan’s involvement in the arms race goes beyond that. It is both buying corvettes from South Korea and building its own. It launched its first guided missile ship, the “Kazakhstan,” this past year. It will build another two ships of the same class this year. Turkmenistan is not lagging far behind. Ashkhabad joined the arms race in 2009 when President Gurbanguly Berdymukhamedov announced plans to build a naval base to defend its coast. Ukraine purchased Kalkan-M- and Grif-T-class Ukrainian patrol boats, and Iran leased seven coastal defense boats and a destroyer. Turkmenistan bought several patrol boats from Russia and Turkey. However, the Turkmen authorities evidently did not believe that sufficient, and the South Korean company Hyundai Amco began constructing a shipyard in Turkmenbashi, where they plan to build Arkadag patrol boats. Iran already has a powerful navy in the Caspian Sea, and it is still increasing the size of its naval force there to control disputed areas. But Russia has the largest navy in the Caspian Sea. Russia’s Caspian Sea Navy will receive at least 16 additional ships by 2020. Several aviation units will also be moved to the Caspian region. The Caspian Sea Navy will get Bastion coastal defense missile systems capable of destroying surface targets with supersonic Yakhont cruise missiles at ranges up to 300 kilometers. The Caspian Sea Navy’s flagship, the Tatarstan patrol ship, mounts the Uran missile system, which can destroy any target at a range of 130 kilometers. Alternative Research Center Director Andrei Chebotarev notes that if the United States sends military forces to the Caspian Sea, oil is probably the reason. “Americans operating in the Caspian Region — and by that I mean Chevron and Exxon Mobil (developing the Kashagan Field) — need to provide for their own security. Especially since the defense departments of the two countries have already made attempts at cooperation,” the expert said. Velizade believes that to allay suspicions and take full advantage of the Cooperation Agreement on Caspian Sea security there needs to be an exchange of information; meetings and consultations need to be held; operating experiences need to be shared; and coordinated actions in areas affecting security must be implemented. Experts believe that economic security is particularly important. 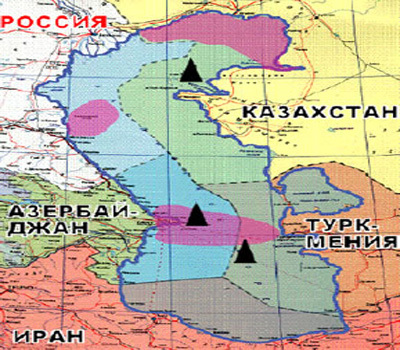 As with military-political security, the plans of the countries in the basin to develop the resource base of the Caspian region also differ. To be fair, however, I should point out that the differences are less significant in this area and have more to do with methods for achieving goals essentially shared by all of the countries there. Each of the five countries on the Caspian Sea is implementing its own program to develop the region and its waters. The Caspian Sea is growing in importance for the economies of the countries bordering on it. That factor is also increasing interests in cooperation. For example, the development of port facilities on the Caspian Sea and the buildup of countries’ merchant and tanker fleets are transforming the sea into an important subregional shipping hub. However, the process is encountering problems due to the insufficient development of a modern transportation infrastructure, the system of logistics centers, and the weak interaction between the port facilities of the coastal states, among other factors. As I observe the nature of economic development in the Caspian Sea region, I sometimes conclude that the countries engage more in competition than in real cooperation. The situation is not conducive to the formation of a common Caspian economic space whose effective utilization would benefit all five countries. This creates definite economic risks that need to be resolved effectively. The establishment of a Caspian Economic Cooperation Organization (CECO) has been suggested as an option for years. “Out of all the proposals that have been made, it is the only one that offers a more or less clear framework that defines both the main features and the vector of economic cooperation in the Caspian Sea basin. And that is why it is extremely important that it be studied,” Velizade says. Viktoria Panfilova is a political columnist for Nezavisimaya Gazeta. Exclusively for New Eastern Outlook.